People are excited about Thanksgiving, and people are just as excited about the day that comes right after, which is Black Friday. During Black Friday, many stores go on a massive sale, selling their products and supplies at very cheap prices. Aside from these surprising bargains from shops that many people are after, there is also another kind of event that you can always find during Black Friday, and these are parties in clubs. People often find a one-day celebration not enough to commemorate such a historical event, so they would almost always extend it to the following day, or even until the weekend. 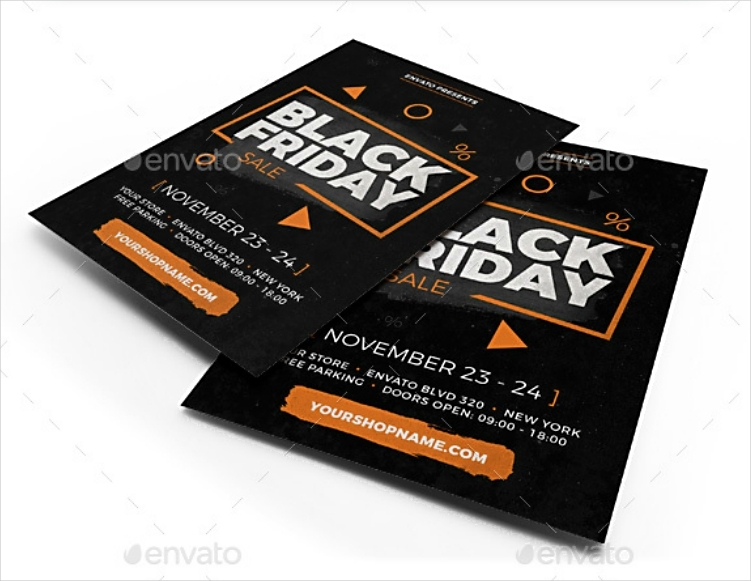 Whether you are managing a business and are planning on offering to sell your products at bargained prices, or you simply want to host a party on Black Friday, then you may need to make use of flyers to promote your event. 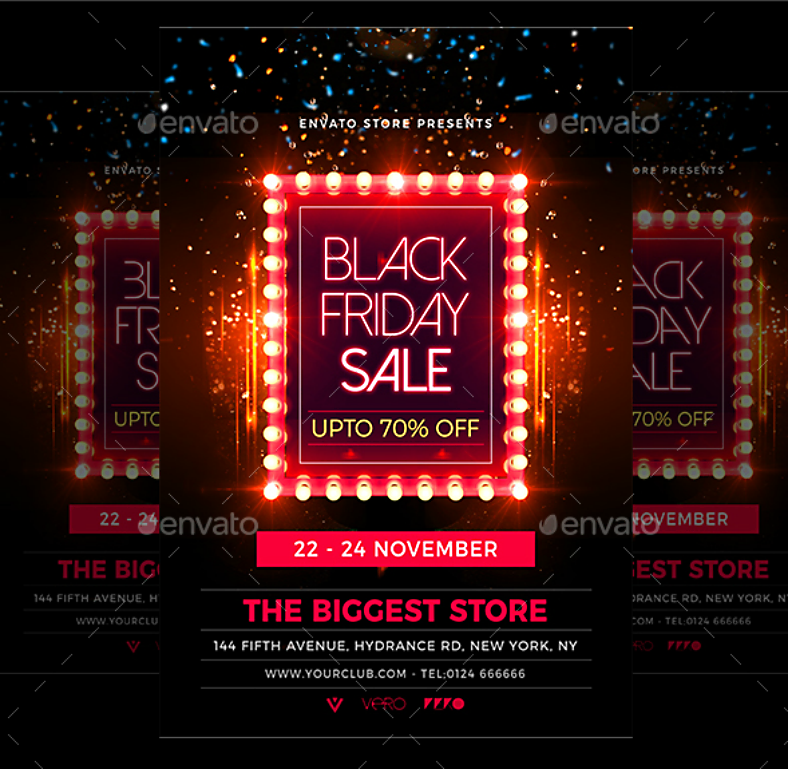 Lucky for you, you won’t need to go to other websites or use search engines to look for Black Friday event flyer designs because we have already gathered the best ones here for your convenience. 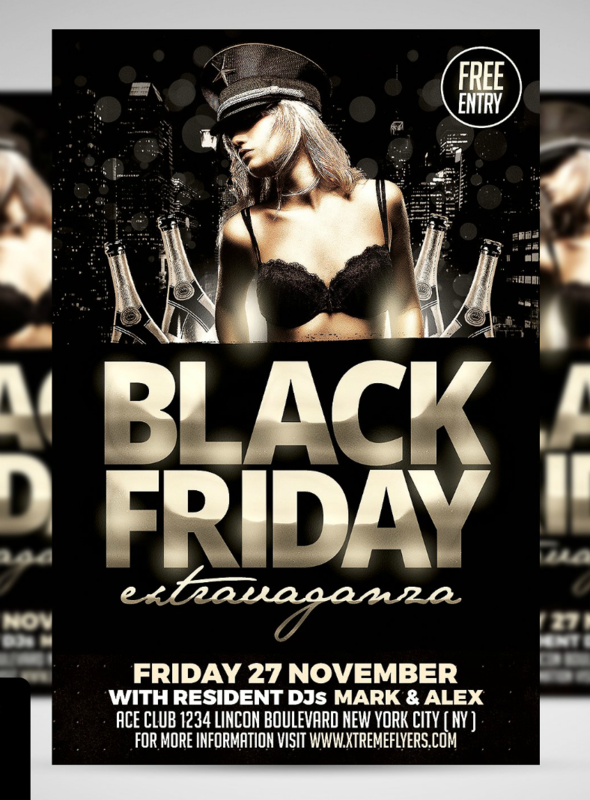 As mentioned earlier, sales and parties are the two most common events that you can find during Black Friday, so we brought you flyer designs for those two events here. Go ahead and check out the flyer designs yourself. Whether you are trying to sell electronic gadgets, cosmetics, clothes, or anything, the design above may interest you from its informativeness and simplicity. Using this flyer, prove to the public that you are offering the best deal of the year by indicating on the space provided the percentage of your deductions for your products. 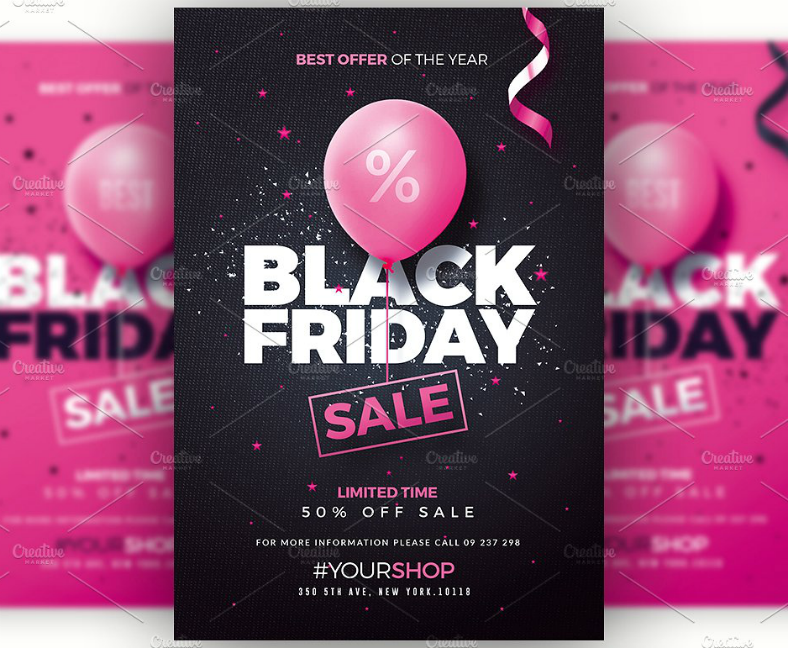 This advertising flyer design simply contains a few elements, which include the pink balloon, and some text for informing people what this flyer is about, and all these elements placed over your choice of a textured black or pink background. 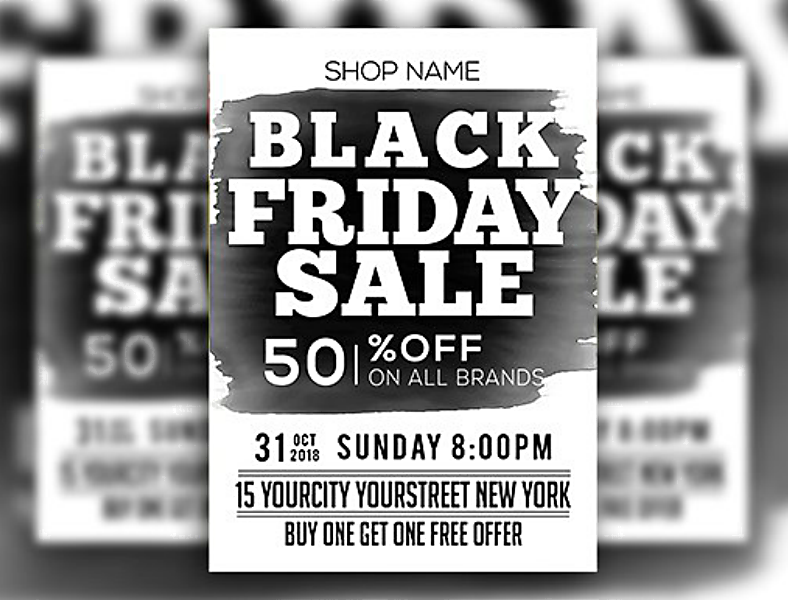 Embrace simplicity with a touch of modernness with this achromatic but attractive Black Friday flyer design. For clarity, the design above uses only the black and white colors, and the graphics used are very minimal, limiting only to a thin, white border and some text. The background of this flyer design is comprised of a pattern of dark colors, specifically black and two shades of gray. If you opt to go for a simple look for your flyers, then this design may be perfect for you. There is always something about this design that I really love, and it mostly falls on the typography. While we’re not entirely sure if you like this typeface, many consider it as unconventional, and even if each letter is not completely drawn, the message can still be conveyed when the text is taken as a whole. You can even find this typeface being used as title cards for television shows or movies.The font that spells out the event is intentionally enlarged to notify readers on the occasion that this flyer is trying to represent, and the relevant details regarding the event are written in-between those large fonts. For more fonts that you can use for this flyer design, check out our collection of typography fonts. 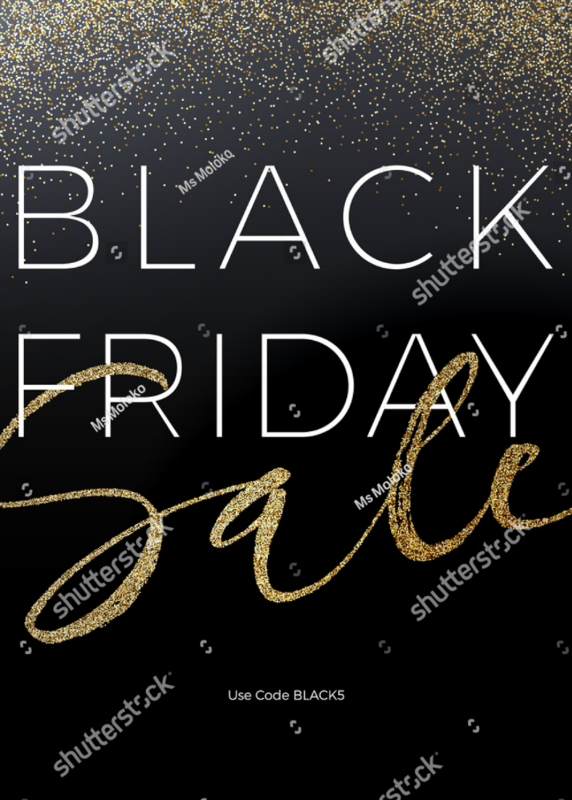 As mentioned earlier, club parties are also held during Black Fridays, and these parties are usually held to extend the Thanksgiving celebration until the weekend. Just like most parties, this usually involves drinks, dancing, and a lot of music that is usually conducted by a DJ. 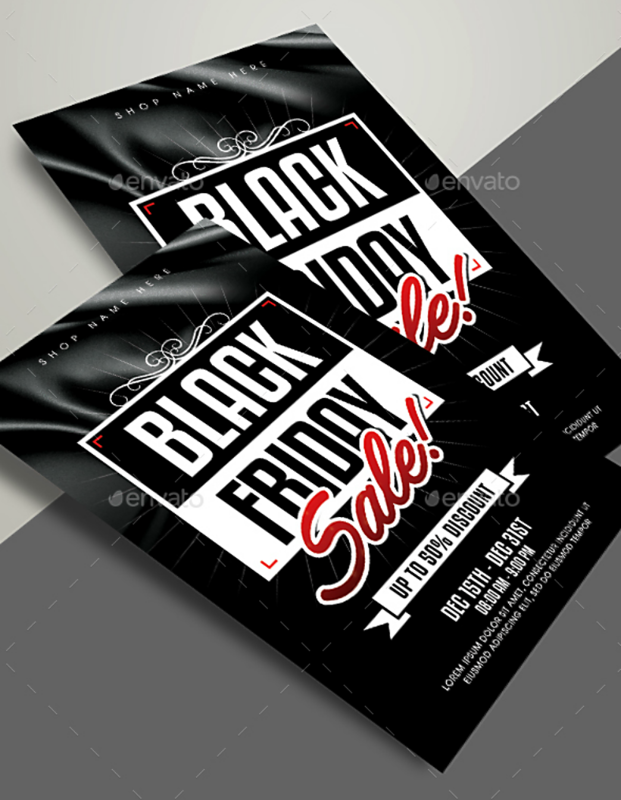 For the Black Friday dance party flyer design shown above, it contains an image of a dancing woman in the center with wine bottles seen on both her left and right side. The woman background seems to be a view of the city at night, with the only source of illumination being the lights coming from the buildings. 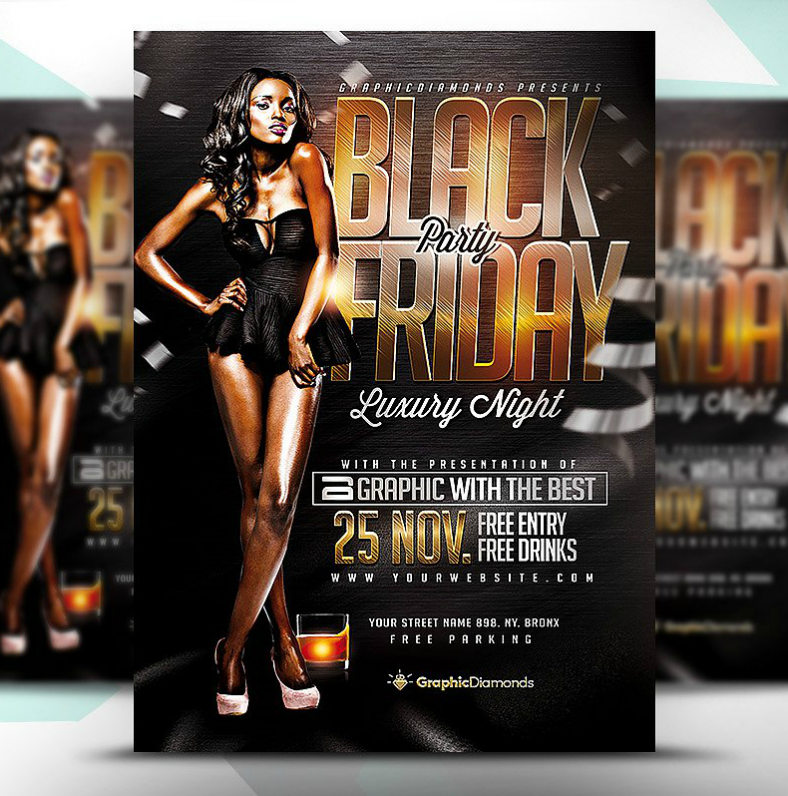 Here is another Black Friday party flyer design that you can also use if you didn’t really feel like the previous one was what you needed. While the first one only showed the head down to her upper torso, this one shows the entirety of the woman. For this flyer design, the woman is located only on the left half of the design while the right half is used to write down the relevant details about the event, including the date, time, the special participants, and some freebies. 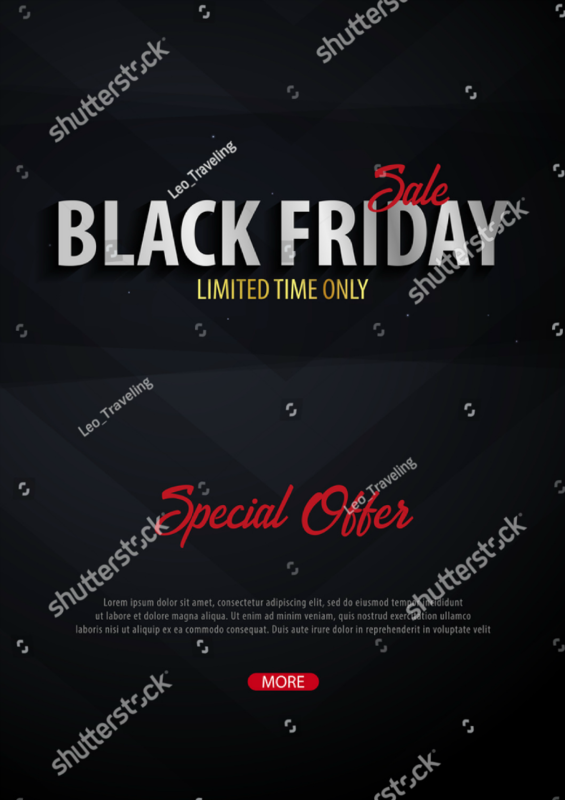 Here is a totally editable design template that you may find very useful for creating your own Black Friday flyers. As you can see from the sample above, the boxes intended for the images are blank, which only shows the extent of this design’s editability. 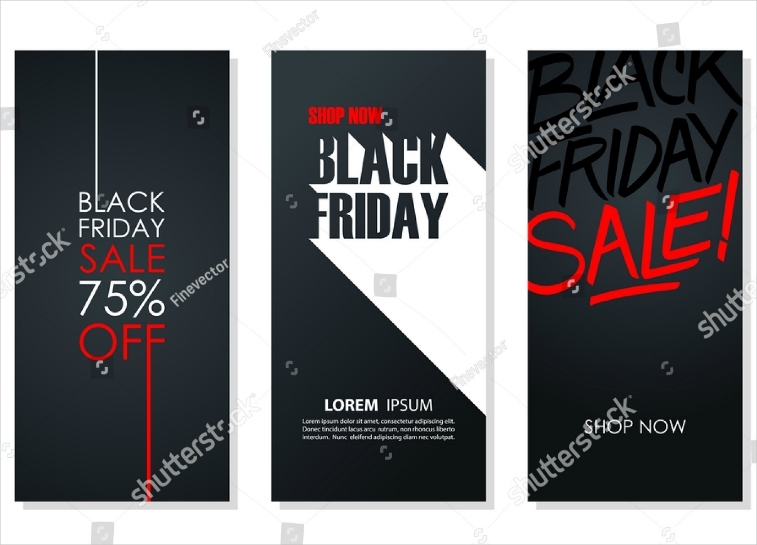 Since this sales flyer design only allows you to feature four products, make sure to pick out only the best ones that you want to advertise and use sharp images that highlight the best features of your product. This way, it gives readers an idea of what your business is trying to sell while also emphasizing best qualities of the product. 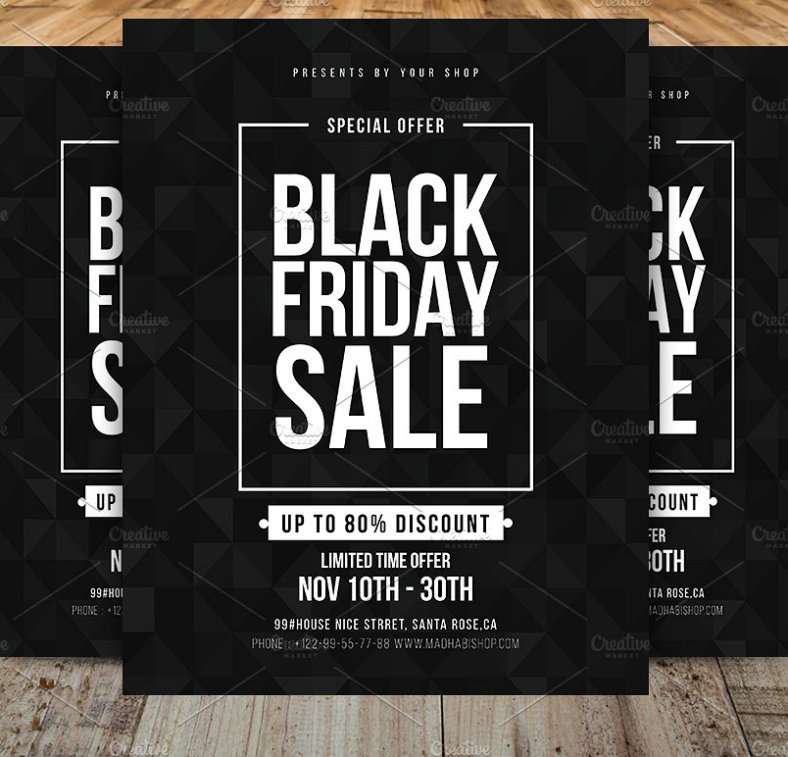 If you think that one design is not enough, then we have an entire set of six Black Friday flyer designs just for you. For just $7.00, you can have all these flyer designs that are distinguishable and unique from each other. 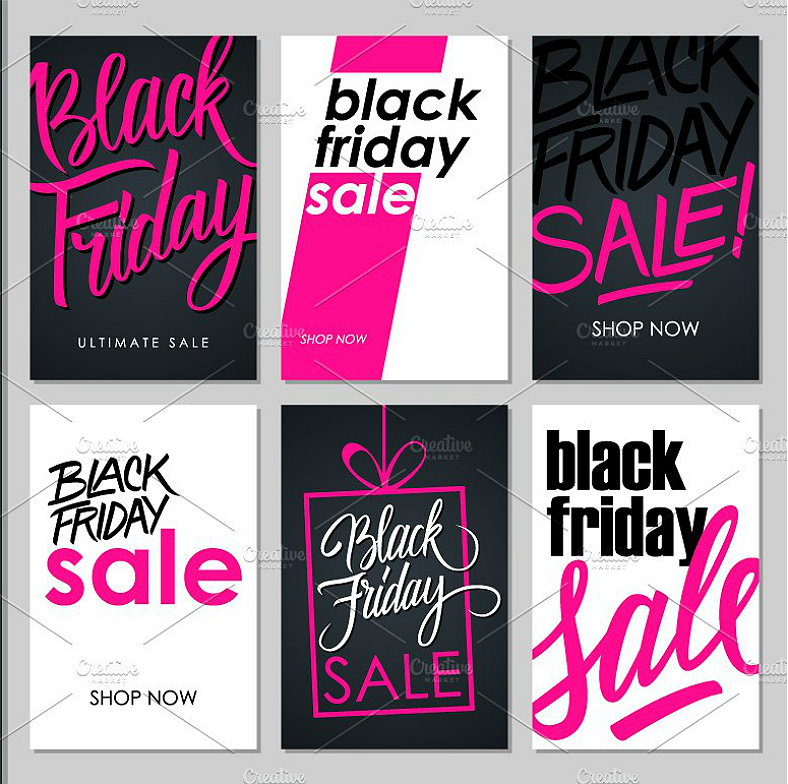 As you can see from the sample image above, all of the flyer designs adapted a white, black, and purple, and while some designs focused more on typography, some have also incorporated the use of line art. 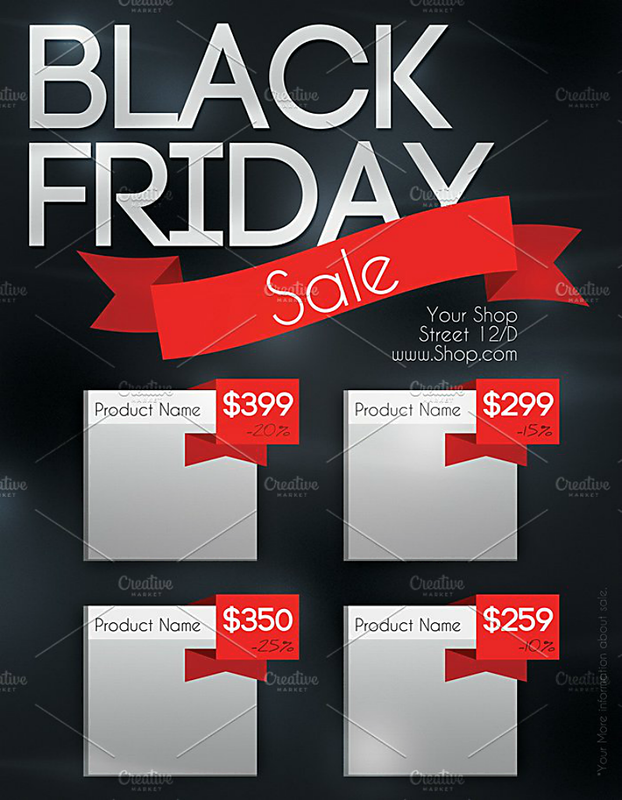 If you are tight on the budget, then why not take advantage of this set of Black Friday flyer designs. 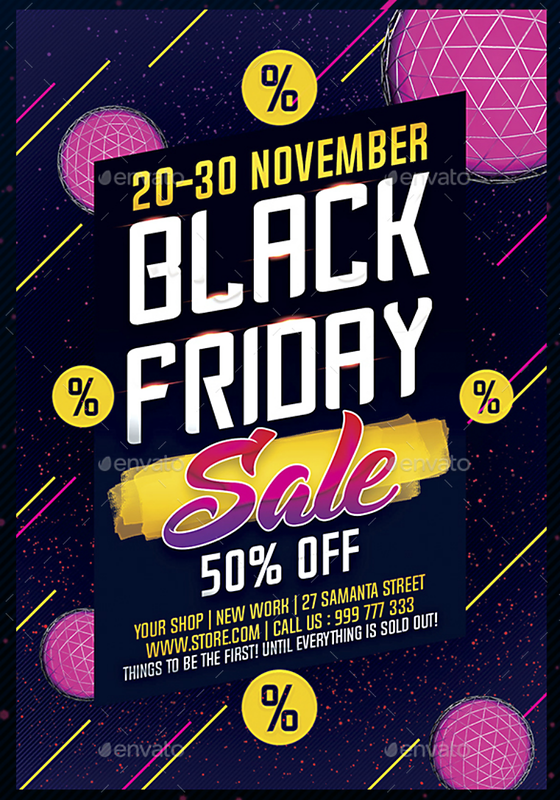 Here’s another artistic Black Friday flyer design that you might also be interested in, and this one is able to balance simplicity with modern artistic features, and this helps in increasing this design’s level of appeal. As you can see on the upper portion of the flyer design, there is a space provided for you to indicate the percentage of your discounts. But aside from that feature, the level of editability for this event flyer design extends to the rest of the elements, which allows you to edit them according to what’s appropriate. 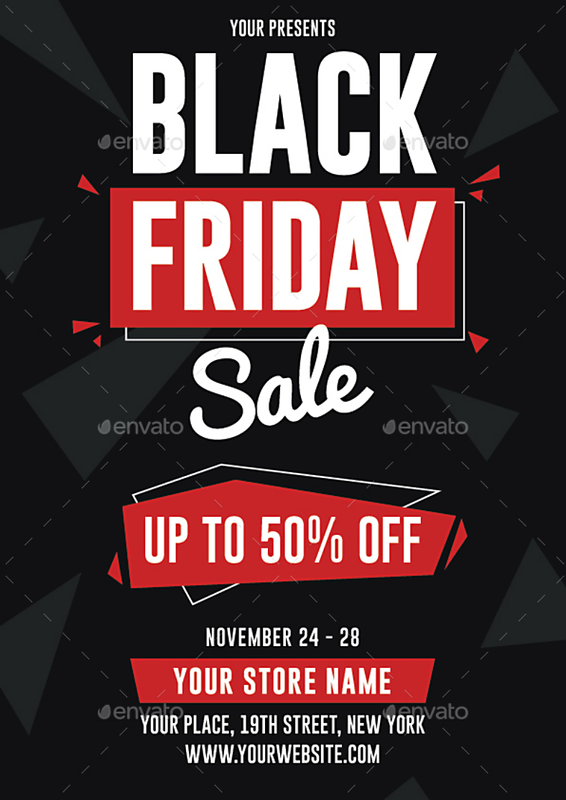 The most common color scheme that you can find during Black Fridays is black and red, and this flyer design definitely follows suit. As you can see from the sample image above, the entire design uses the red, black, and white color scheme, which not only proves the attractiveness of the design, but it also helps in organizing the content, which in turn makes them easier to read. With the effective use of these colors on your design, you won’t need to add more graphics and elements on to your flyers. 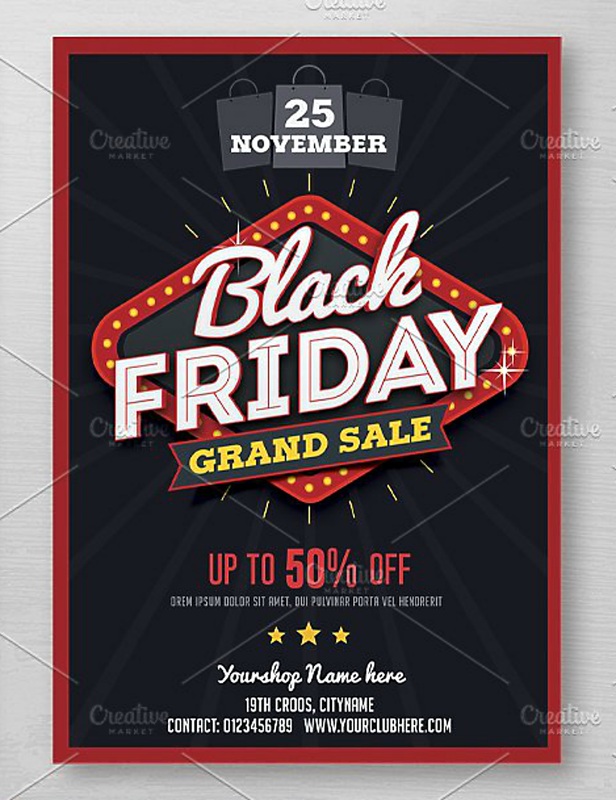 The first word that comes to mind when I look at this design is dazzling, and indeed, this dazzling Black Friday flyer design can be described as more than just sufficient for capturing people’s attention. Unlike most flyer designs on this collection that stuck to the usual Black Friday color scheme of black and red, this one leans more toward yellow and purple. 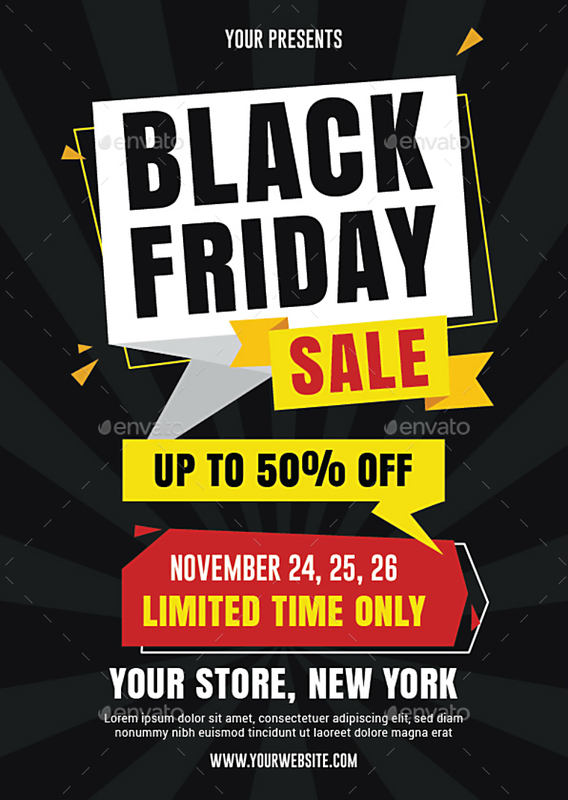 Nobody ever said that you should always abide by the rules when it comes to designing Black Friday flyers, what matters is how you present your flyer and if it is able to turn heads, but from this design, you have nothing to worry about. 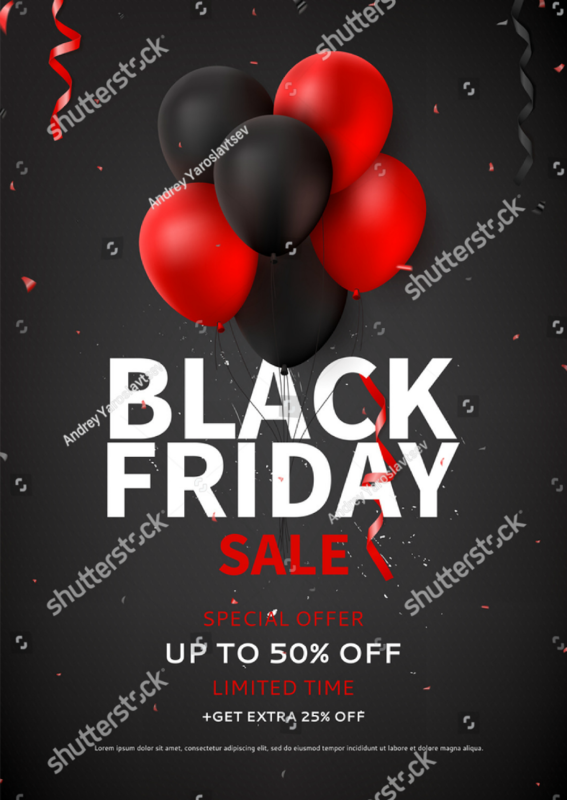 Both Thanksgiving and Black Friday deserve a celebration, and this flyer effectively demonstrates that with the black and red balloons on the design. While this isn’t the first design in this collection that features balloons, this one also captures the excitement that people usually experience when shopping during Black Friday. Don’t underestimate this simple invitation flyer design. As long as you edit it properly and supply the details necessary for the readers, then you don’t need to worry about your flyer not being able to gather the needed attention. 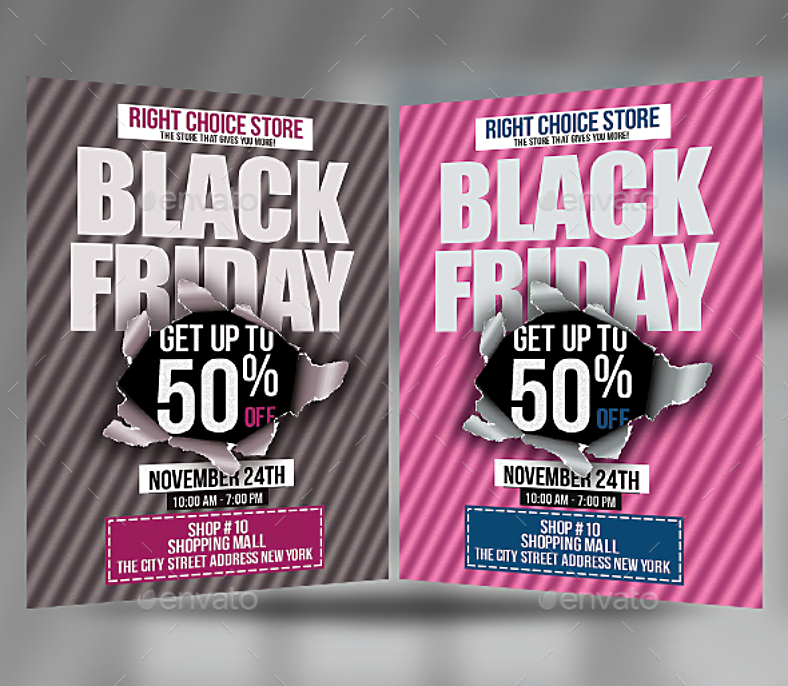 Check out this set of flyer designs for a Black Friday sale. You can either use only one of these designs or you can also use two of them to take advantage of both sides of the flyer. What’s great about these logo designs is that they are unique from each other from the simple typography to how the entire design is presented. What’s even better is that these designs are minimalistic, and they need no further explanation for people to understand what these flyers are about. 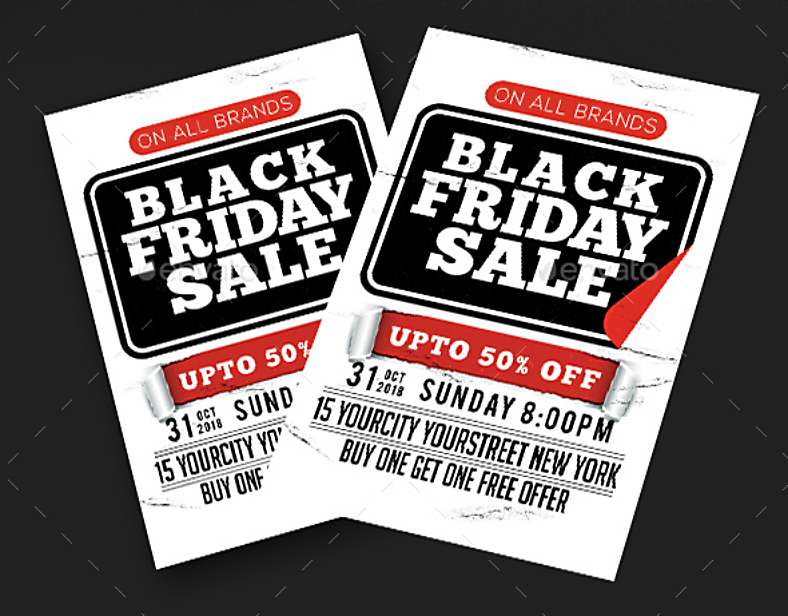 Now, to conclude this article about Black Friday flyers, let’s start off by explaining to you where and how we were able to come up with this collection. First of all, these flyer designs were gathered from multiple websites, those that are highly reliable and offer more than just flyers. And on these websites that serve as our sources, the designs were contributed by some of the world’s most talented and creative graphic artists. With regards to the editability of these flyer designs, you have nothing to worry about since many of these are in the vector format, which is the format of choice for graphic artists and designers. The reason behind this is because designs made in the vector format are very easy to edit and it also allows you to individualize the elements on the design. What this means is that you can edit, add, and remove specific elements on the design without altering the rest of the elements. Another reason why the vector is the preferred format is that their elements are able to retain their high resolution even after extensive editing and resizing. Getting your hands on these artistic flyer designs can be done very easily as well. As long as you have a good Internet connection, you may be able to download these designs with the click of the download or buy now button. 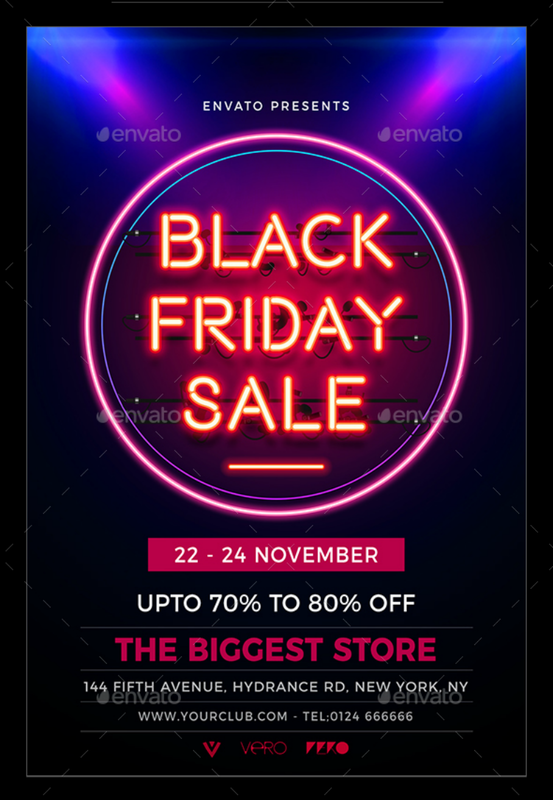 As you may have noticed, the download or buy buttons indicate a corresponding price, which only makes it clear to all users that these stunning flyer designs can be downloaded for a very reasonable fee. The designs of these flyers are already enough to help capture the attention from people, and as long as you edit them properly and state only the relevant details needed by a reader, then you won’t need to worry about anything. 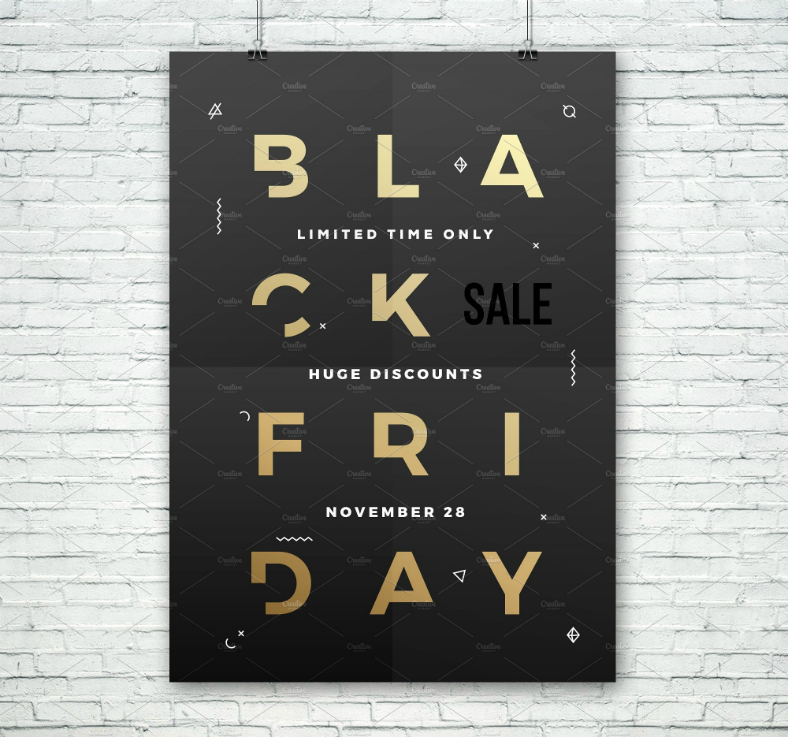 Save yourself the hassle and download your own Black Friday flyer design now.